Usually, when someone in our house starts to get sick, I go grocery shopping and get all of the stuff I need to make our “I’m getting sick” meal plan. 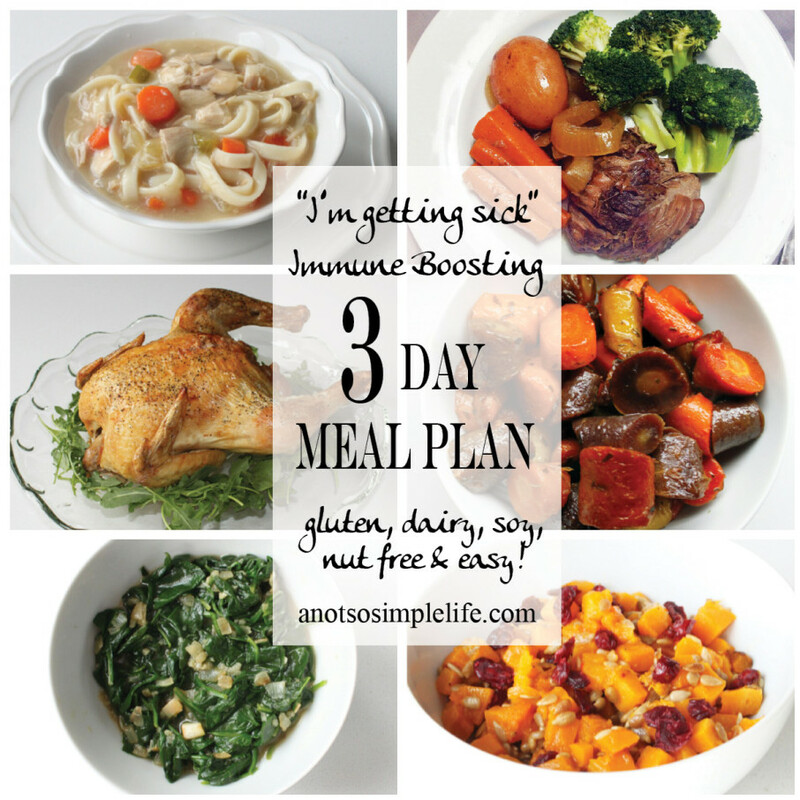 The meal plan started out as a convenience thing (basically, making a whole chicken to have broth and leftovers for soup) but has, over the course of each sickness, been modified to add additional dishes that are easy to prepare and full of nutrients to help boost the immune system. Three days ago we spent 2.5 hours on the way home from Colorado sitting next to a horribly sick toddler – lucky us! Needless to say, this is the menu this week! So, how can I naturally boost my immune system? What foods are naturally immune boosting? 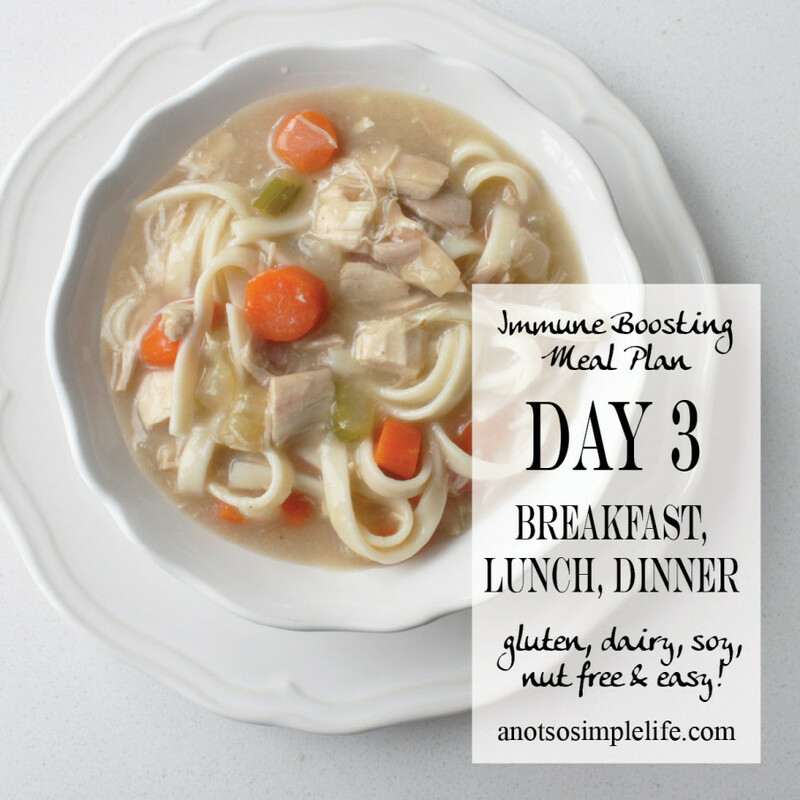 What vitamins and nutrients will help to boost my immune system? What are some easy, healthy recipes that contain these to make when you’re sick? Keep reading! So, a little background on me….I used to get sick ALL the time. At least once per year I would get bronchitis, almost every year I came down with strep throat, and I always got at least one bout of the flu and multiple colds – these sicknesses would linger too. Oh college, that part was not fun at all! Now, I hardly ever get sick and when I do, it lasts 2 or at most 3 days. What did I do? Well first, I changed my diet to cut out processed food, and also went gluten free, dairy free, and soy free (I am also nut and legume free because of a deathly allergy) – This just made me healthier all around (I was a big ball of inflammation before). I also started taking probiotics, which I now take every single day (and I swear I get sick if I stop taking them). Now… being much healthier means my immune system is running a bit better than it was before, but that doesn’t mean I don’t get sick, it just means I get sick less often and it’s less severe. Actually, I just 2 months ago I dodged quite the cold, congestion, runny nose, cough, icky thing. My son came down with it first, (which led me to start putting together the research for this post) and although there were a few moments when I felt like I might be catching it (a bit of sinus pain or a smidgen of aches before bed) I never actually got sick! So, I’m happy to report – it’s been months since the LO got sick and I didn’t get it! This is the first time that’s happened (usually I get it but only for a day or two)! I can’t know for sure how this meal plan played a role but I do know I followed it to a T, and added the butternut squash and sunflower seed recipe so maybe that’s it? Who knows, but it worked for me! So your’e chomping at the bit I’m sure – now to the good stuff! Why did I choose the foods/meals I chose? First, they’re easy, with minimal prep time and cleanup (because, who feels like hunkering down, chopping veggies in the kitchen when you feel like crap)! Most of the cooking and prep is done on day 1, which is when I’m usually feeling the best (because I’m just starting to get sick). Second, these foods contain vitamins, minerals, and nutrients that are either proven, or rumored to give your immune system a boost – Like…. Garlic: When designing this diet I had a lot of discussions with people via social media – mainly, what do they eat to help combat illness? One of the ingredients that topped their lists was garlic. When crushed, the compounds found in garlic mix, creating allicin. This compound has been found to have antibiotic properties. In fact, some studies have even shown that it is effective in battling MRSA – pretty cool! This amazing compound only exists in raw garlic and dissipates a few hours after the garlic has been crushed or chopped (therefore I recommend chopping the garlic 5-10 minutes before you consume it). Also note, it can be a bit spicy so make sure you don’t eat too much at one time! Foods high in Vitamin A; Sweet Potatoes, Butternut Squash, Spinach, Broccoli: According to a Harvard Medical School article (found here) “vitamin A plays a role in infection and maintaining mucosal surfaces… Vitamin A deficiency is associated with impaired immunity and increased risk of infectious disease”. So it’s important to make sure you’re getting enough vitamin a to keep your immune system in top shape. If you’re eating the right foods it’s not hard to get the right dose of vitamin A – 1 cup of sweet potato has a whopping 377% of the recommended daily intake of vitamin A, butternut squash about 297%, spinach about 56%, and broccoli, about 18%. Vitamin A is fat soluable so it is better absorbed if eaten with a healthy fat. You’ll notice I include them in my recipes. Foods with Vitamin B6; Chicken, Butternut Squash, Sweet Potato, Broccoli: An adequate intake of vitamin B6 is important to stay healthy. According to this article from Harvard Medical School, “Several studies have suggested that a vitamin B6 deficiency can depress aspects of the immune response”. Other studies have shown that diets too low in vitamin B6 can lead to increased risk of heart disease, anemia, and more. In these recipes you’ll get vitamin B6 via chicken – 1 cup chopped contains 30% of the recommended daily value, butternut squash, which contains 20%, sweet potato, which contains 15% of your daily value, broccoli which contains 15% and bananas, which on average contain about 20% of your daily value, each. Foods high in Vitamin C; Broccoli, Orange or Orange Juice: The jury is still out on vitamin C and the immune system. According to this article “For a long time there has been a controversy whether vitamin C can contribute to the prevention and therapy of the common cold. Several cells of the immune system can indeed accumulate vitamin C and need the vitamin to perform their task…[and] a vitamin C deficiency results in a reduced resistance against certain pathogens whilst a higher supply enhances several immune system parameters”. Some researchers believe that Vitamin C works in concert with other micro nutrients, rather than providing benefits alone. Either way, I’m pretty convinced that vitamin c is important for my immune health, and quite honestly, I don’t need to know exactly how/why. Years of speculation are good enough for me because we still have to eat, right? Why not choose stuff that might help us feel better sooner? You may be thinking you need to load up on a bunch of citrus then right? Think again! A serving of broccoli has a whopping 220% of your daily value of vitamin C, while an orange only has 85%. A glass of orange juice offers 71%, sweet potatoes also 14%, and a single banana, 17%. Vitamin D; Egg Yolks, Fatty Fish, Supplements: Vitamin D is produced when our skin is exposed to sunlight (unfortunately, here in Michigan right now we’re not getting much of that). Maybe that’s the reasoning behind “fresh air” and staying healthy? Maybe it’s more about being outside in those rays! There have been a lot of studies that have proven that Vitamin D is important and that Vitamin D deficiency leads to increased risk of infections. There is a debate about whether taking vitamin D in supplement form is beneficial, but because it can be hard to derive from food, my family takes supplements. Fatty fish would probably be your best bet if you’re looking for a way to ingest more vitamin D, specifically salmon, which has more than the recommended daily value in one serving. I personally love salmon, but not when I’m sick, so it’s not in this meal plan. Egg yolks do offer some vitamin D, about 11% the daily value. There’s a lot of controversy over the recommended daily intake of vitamin D also. You can read more about it here. Vitamin E; Sunflower Seeds, Almonds (I’m allergic), Olive Oil, Spinach: Many studies suggest that Vitamin E plays a large roll in maintaining the immune system, for example in the study found here, vitamin E deficiency was associated with increased infectious diseases (as well as the incidence of tumors – eek!). I have to admit, this is a vitamin I haven’t paid much attention to in the past. I actually came up with a new recipe to include in this meal plan that includes some foods high in vitamin E. Specifically, I wanted to include sunflower seeds, which contain 237% of the recommended daily value per cup. Other foods that contain vitamin E included broccoli 10%, spinach 18%, almonds 181% per cup, olive oil 10% per tablespoon, sweet potatoes 15%, and butternut squash 13%. Zinc; Beef, Spinach, Sunflower seeds: Zinc is a trace element that is essential for cells of the immune system. Zinc deficiency affects the ability of immune cells to function as they should. Some recommend taking zinc supplements such as things like Cold-Eez. I personally don’t take them and just make sure I’m eating enough zinc in the foods I’m eating like, Beef which, depending on the cut could have up to 95% of your DV. Spinach, 1 cup cooked has 10% DV, and sunflower seeds, which have 10% DV per ounce. Fat: Vitamin A is a fat soluble vitamin, meaning that it is more readily absorbed when eaten with fat. What does that mean? Well, if you can have dairy then Yay! Butter! If you can’t have dairy, make sure you’re enjoying your meal with other healthy fats like good quality olive oil, avocado oil or some slices of avocado. Ok, now that we’ve been though all of that…. Finally, the actual plan…..
Usually can tell a day or two before I’m getting sick so I have just enough time to get to the grocery store to get these meals together. Oddly, we didn’t feel like we were getting sick the last time I made my favorite convection cooked whole roast chicken, and then started some homemade chicken broth in the Crock Pot, but it just so happened we were. I should have known, my little man, for the last year or so (he’s only 2) will only eat oranges and drink orange juice for the entire day before he comes down with something. It’s super strange! I’m a firm believer in trusting out instincts though so I don’t limit his orange intake on those days. I swear it gives him an immune boost that helps him kick his colds way quicker than most kids. Note that this meal plan starts at dinner (not breakfast). 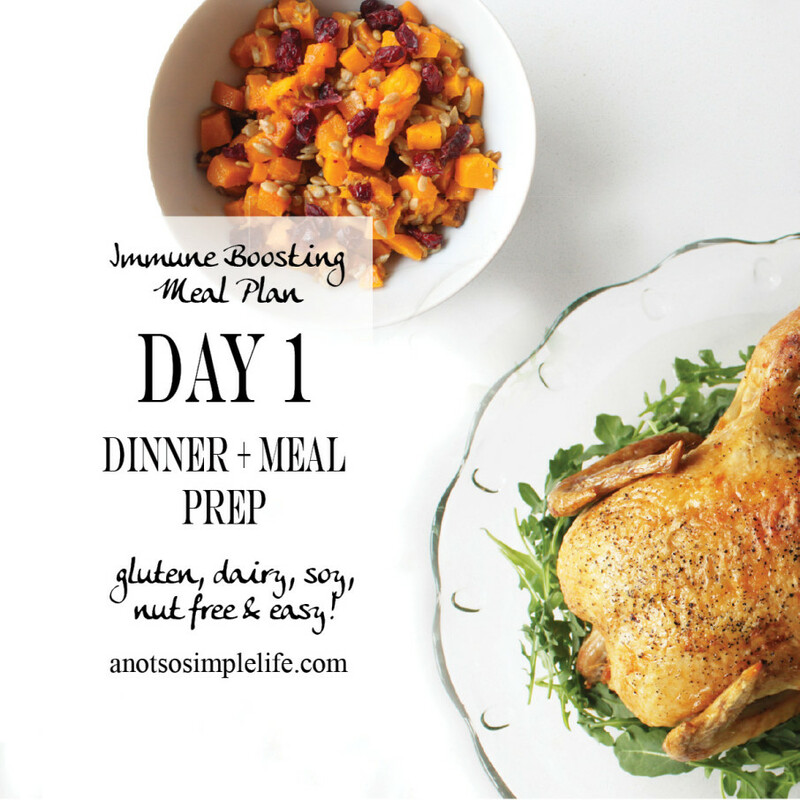 On day 1, you’ll prep as much as you can for the entire 3 day meal plan. If you’re like me, you’ll feel the best on this day so it’s super nice to have it done and out of the way. Convection Roast Whole Chickens (Cook 2 chickens so you have leftovers, baking time may be slightly longer. I like to use the “multirack convection” setting on my oven) – you could also do Crock Pot Whole Chickens if that’s easier for you but the meat will be more dry. Roast butternut squash with Cranberries, Sunflower Seeds and Honey Vinaigrette. Be sure you roast your butternut squash and set aside about 2 cups to make Roast butternut Squash and Spinach tomorrow. After Dinner Cleanup & Prep: There is lots of leftover chicken on purpose! Toss the chicken carcasses in the crock pots (I have 2, 1 for each carcass – if you only have 1 then refrigerate the second carcass to make a second broth tomorrow) and follow my instructions for homemade broth here. Overnight: Your broth will take care of itself while you sleep! I made 2 batches of homemade chicken broth in my 2 Crock Pots, 1 carcass per pot. Breakfast: I LOVE spinach because it’s so easy – no chopping, slicing, or dicing and it even comes pre-washed. This is super easy because your onions were already chopped yesterday. All you have to do is mince some garlic! 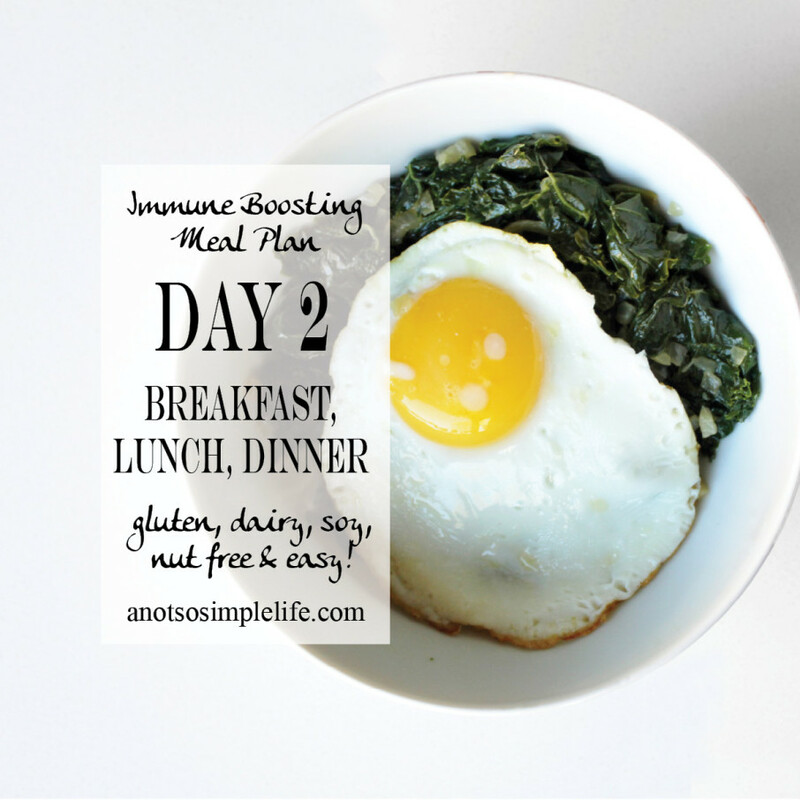 Immune Boosting Garlicky Spinach with sunny side up eggs (using 1/2 cup of broth made last night). **Save 2 cups of the leftover spinach to make roast butternut squash and spinach tonight for dinner, eat the rest of the leftover garlicky spinach for breakfast tomorrow. Lunch: You have homemade broth from last night and everything else chopped from last nights prep – lunch is almost done already! I usually also have some sort of fruit, depending on what’s good at the grocery store. This week it was strawberries and blueberries. Dinner: The hard part’s done for you! The only real cooking you have to do today besides heating stuff up is sauteing the peppers and mushrooms for the butternut squash and spinach! Roast Butternut squash and Spinach (using reserved butternut squash from yesterday and 2 cups of spinach from this morning. Dinner: Crock Pot Pot Roast. This is definitely my choice here because of the ease of preparation. A few months ago I also started using essential oils, I’m still evaluating what brands I think are best. So far I’ve tried a few different ones. I will tell you that I used a few different “Protect/Theives” type blends and I LOVE the smell of them all. I use this type of blend the most often when we’re sick. Last time the LO was sick I difused it and although I felt the sickness that my LO had mildy one day, the day after diffusing I was feeling 100% great (except for the fact that I didn’t get much sleep that night because my LO woke up coughing/choking 4 different times at about 45 minute intervals and eventually slept in my arms on the couch). 2. Take your probiotics! I use a brand that I get specifically from my dietician and take 3 different pills, 1 strain for digestive health, 1 strain for immune boosting properties, and 1 strain for digestive and immune balance. However, when I’ve run out (or I forget them while on vacation) I have tried these three brands and I think they worked well, but remember – I’m no doctor! Always follow the dosing instructions and talk with your doctor before starting any new regimens! : Align Probiotic Supplement for Digestive Health , Culturelle Natural Health and Wellness Probiotic Supplement , and Culturelle Advanced Immune Defense Supplement . The longest post ever! I will be updating it with a printable shopping list in the near future! This post took me like 2 months so it’s 60 degrees today. Hopefully we’re through cold/flu season but you never know!